Find the perfect Abarth car today at Carsnip. We’ve got over 620 used Abarth vehicles available, and our intuitive search system means that you can make the best decision in the easiest way. We’ve made buying your next car easy. Browse over 620 vehicles below. Abarth was founded in 1949 and is now owned by Fiat, producing mainly higher performance, sportier versions of Fiats. In this vein, the 124 Spider is a sleek little roadster that’s a funner version of the Fiat Spider. Returning 170bhp, its upmarket focus on pure performance makes it a great car for enthusiasts. 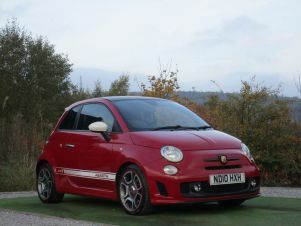 The Abarth 500 is the performance version of the hugely popular Fiat 500. With a 1.4-litre turbocharged engine returning 135bhp, it’s a more sporty and powerful version of its Fiat relative, which stands as a rival to the Mini. With loads of personalisation options available, there’s a good variety of different vehicles available on the used market.